Decorating for Christmas is one of our favorite activities to do together! Each year while we are setting up our tree, we like to decide on a few new ornaments to make. We like to make simple homemade ornaments that aren't very complicated. We usually start decorating the weekend of Thanksgiving and I usually dread it... until everything is up and then I feel like our house is completely magical and I never want to put any of our decorations away. 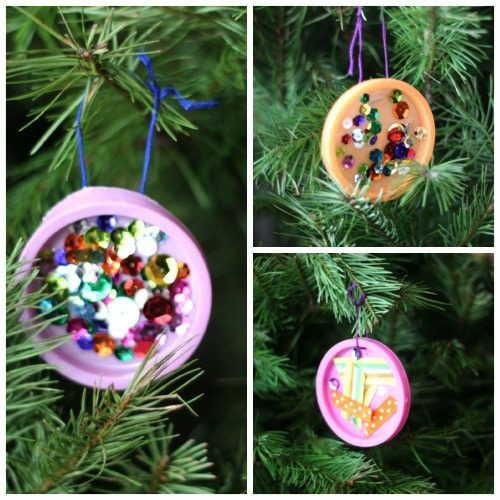 These lid ornaments are an annual favorite and look gorgeous on the Christmas tree! One of our favorite traditions each year is decorating our “kid” Christmas tree with homemade ornaments. This week we set up an ornament making station (inspired by A Mom with a Lesson Plan) and created some simple lid ornaments using materials we already had around the house. The best part about an ornament making station is that there are no rules! Kids can create whatever type of ornament they want using the materials that are out. 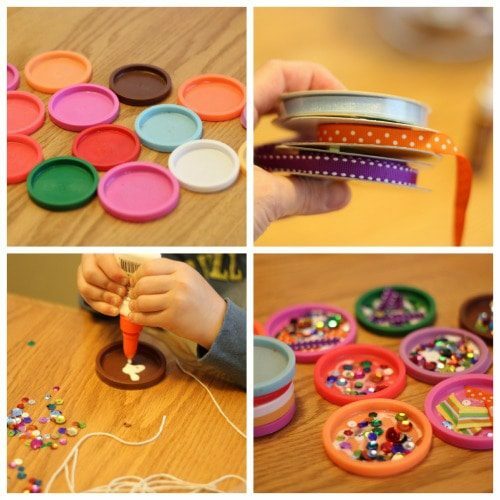 You can use simple materials for toddlers (large buttons, colored glue, and ribbon) and more complex ones for older kids (beads, photos, stickers, jewels, scrapbook paper, etc.). Just set out your materials in an easily accessible spot for your kids. 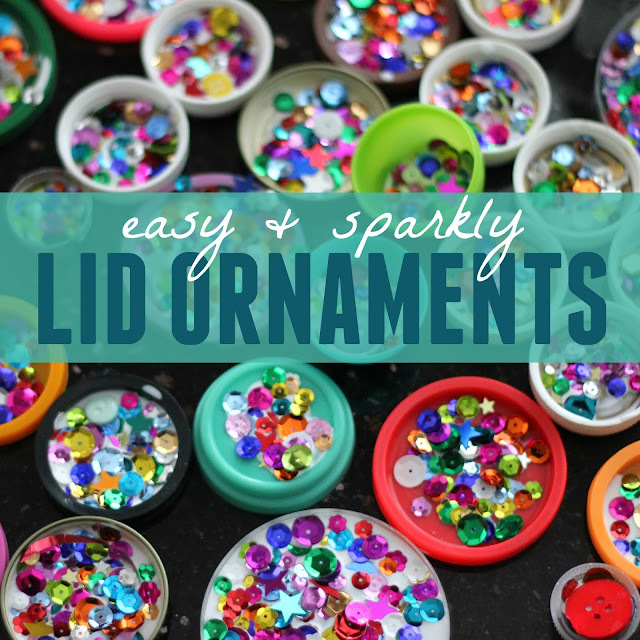 Encourage them to put some glue onto a lid and then start adding their favorite embellishments! We love anything sparkly at Christmas time, so sequins and jewels were the biggest hits on our tree. Let the creations dry and then an adult can use a hot glue gun to attach some string or a ribbon loop to the back of each ornament so that it can hang on the branches of the tree. Once the ornaments are done, kids can hang them on the Christmas tree and admire them all season long! 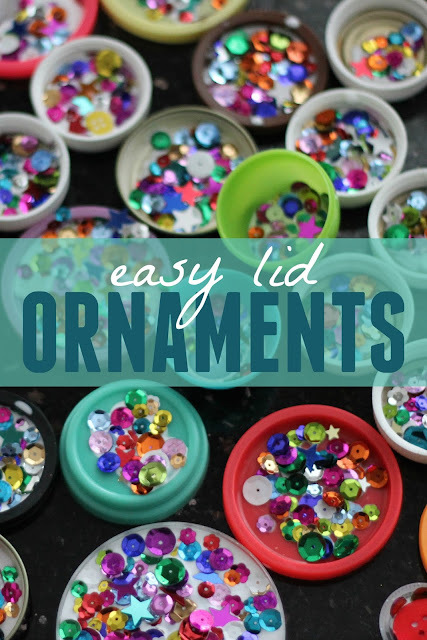 Last week over on Toddler Approved we shared ten other simple homemade ornaments we’ve made for our “kid” tree, so we’re excited to add these lid ornaments to our collection! Have you ever created an ornament station at your house? What would be the most popular crafting item with your kids?